Make and String Up a Polymer Clay Donut Necklace! Donuts are popular. Food inspired polymer clay pieces are also popular. Put them together and you have an easy stringing necklace design because of the ready to use holes. Perfect for a sweets lover. This polymer clay donut tutorial is by Vanessa of Brite and Bubbly. I like how she varied the colors and even the size of the donuts. So you could really have fun with different hues. 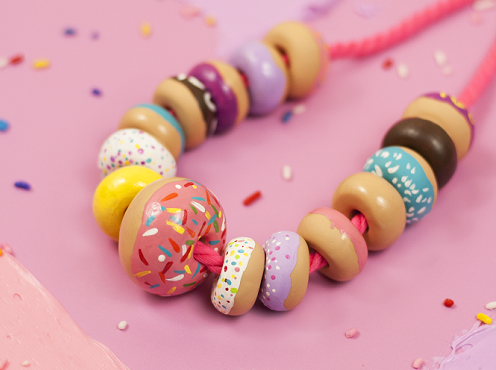 This tutorial can be used to make donut beads not just for necklaces, but bracelets as well. You will have to embed eye pins if you are planning to make earrings.